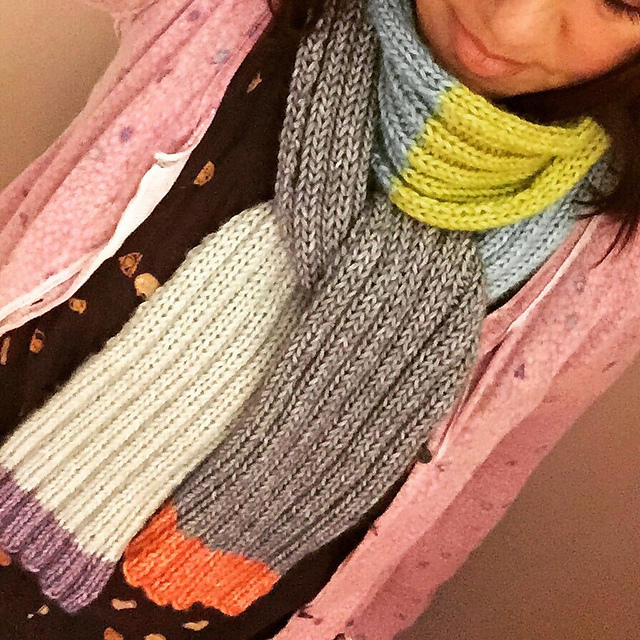 BLTN Part 1: Scrappy Colourblock Scarf Ta-dah! I was looking for some projects I thought I'd posted over Christmas, only to discover I hadn't shown them to you yet. So here, BLTN (better late than never), is the first of them - the scarf made from leftovers of Scheepjes Stone Washed XL from my Cosy Colourblock Shawl, mini hot water bottle cover (both free patterns) and the larger version I made to fit a standard sized bottle, which I also haven't shown you yet. You may have spotted a glimpse of it here and a quick introduction (here) when I cast on, but I'm pleased to properly show you the finished object which is now a much loved scarf. I love the simplicity of this! 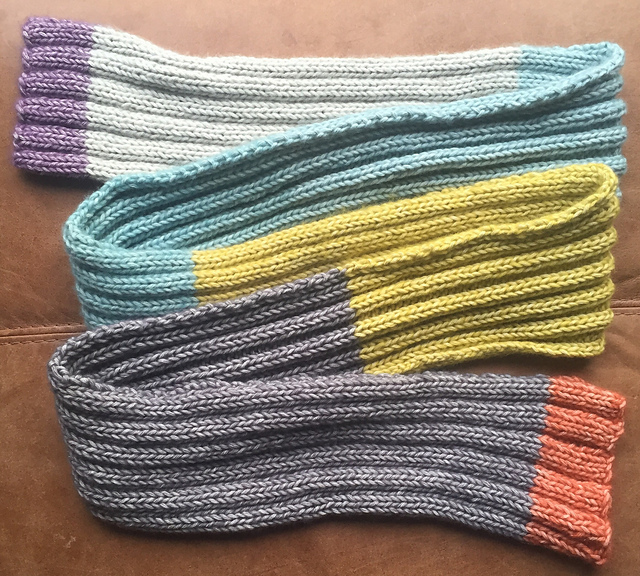 It took a total of 212g which was pretty much every last scrap of these six colours, and was knit on 5.5mm needles using a 3x2 rib pattern. This was perfect relaxation knitting and I'm really missing the yarn after a few months where I used it for various different projects. I may get some specifically for another scarf. 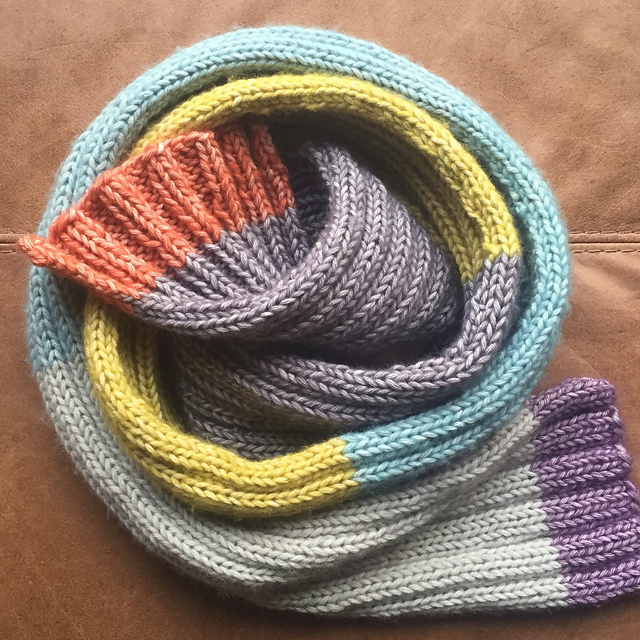 In fact, after seeing my mum's Colourblock Shawl this weekend (it's pictured here) I'm now thinking about getting some in the colours she used, to make a longer wider version... maybe with a couple more colours in the mix too. Scheepjes Stone Washed XL is available from Deramores, for UK and worldwide delivery (find international delivery costs here). I'll be back with another BLTN project soon! Great way to use every bit of yarn you love! I did spot in on instagram I believe. Loving the scarf. Am going to give this a go despite having too many scarves already! Did you cast on 30 stitches? The width looks great.